The item A new chick for chickies represents a specific, individual, material embodiment of a distinct intellectual or artistic creation found in Evansville Vanderburgh Public Library. For Chickies life was good. Life was perfect until . . . CRAAACK . . . the Chickies have a new brother! 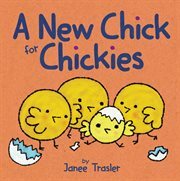 With engaging rhymes and endearing illustrations, Janee Trasler's books are perfect for babies and toddlers to enjoy. Big sisters- and brothers-to-be will be excited to take a cue from the lovable Chickies and cheep for joy when a new baby arrives!